The average length of a lunch break from work is just 22 minutes – two thirds of what it was six years ago. The survey of more than 800 workers by health body ukactive and Sodexo, found most wanted to exercise more, but three quarters said their workload got in the way. 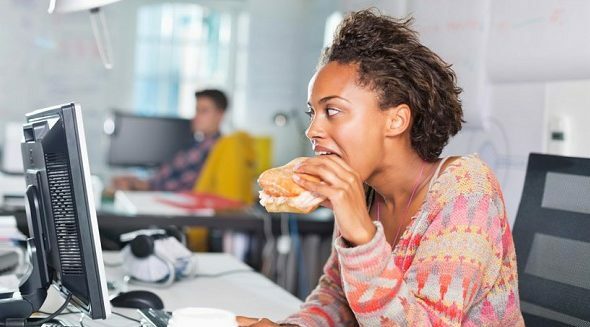 Fitness experts said lunchtimes were being squeezed by the pressure of work. They reported excessive workloads, unexpected tasks an and not enough nearby dining options, The result – nearly one in five workers don’t leave their desk at lunchtime. “These figures are a shocking indictment of modern workplace cultures, where employees increasingly find themselves tied to their desks and screens all day. 77% said corporate gym memberships would have a positive impact on their physical and mental health, while nearly as many said shower facilities and compulsory lunch breaks would boot their health. Workers have the right to one uninterrupted 20 minute rest break during their working day, if they work more than 6 hours a day. This could be a tea or lunch break. The break doesn’t have to be paid – it depends on their employment contract.